Lynne Bickers is a 3rd cousin of Julian Land as their great-grandmothers Jemima and Beatrice Hall were sisters. 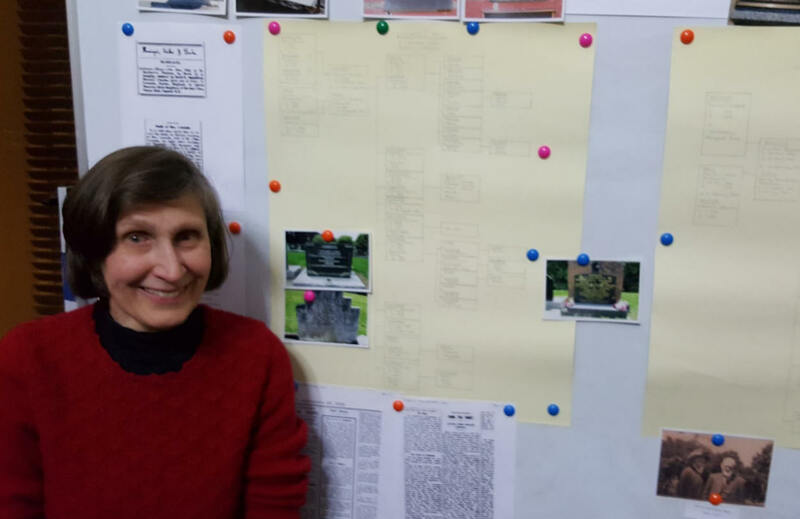 On 27 Oct 2016 she created a display which amongst other things showed a photograph of Jemima Hall and Charles Affleck (lower right). In addition it showed that Jemimas Hall's middle name was Vans (not Vaus) as the grave headstone has it and that date of death was 3 days earlier than the interment date shown on the grave. Lynne also suggested that the full name of Jemima Vans Hall was Jemima Vans Robertson Dunlop Hall. Her Australian guardian (as shown in her marriage record) was Jemima Vans Robertson. Her display showed also that there was a 5th child of Aubrey Lousada and Mary Truscott but that child died very young. This photograph was provided by Bronwyn Simpson on 27 Oct 2016. Its reverse is marked Xmas 1900; at rear are Ben, Aubrey, Tryphena, Barrow and Catherine with Cecil, Horace Frank (babe in Beatrice's arms) Ted and Ruth at front. 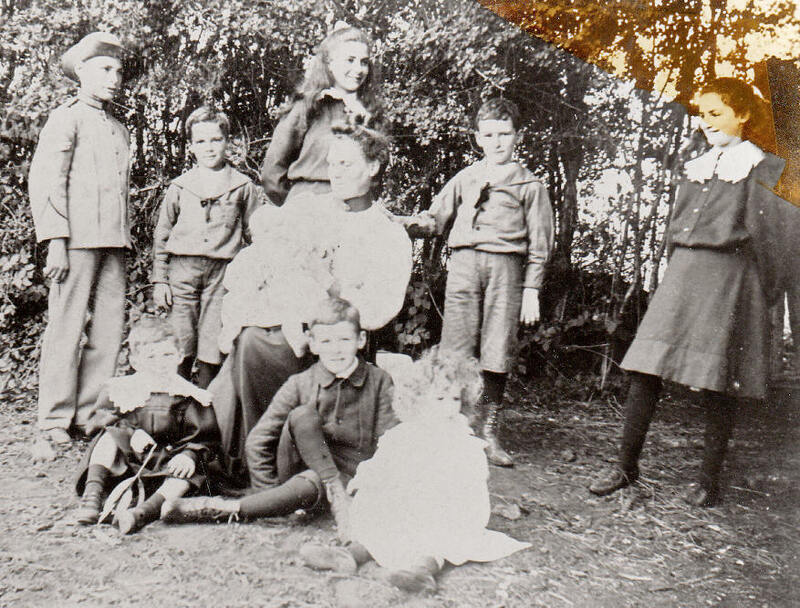 This photograph was probably taken in Warragul - the children appear to have had a full years' schooling that year in Warragul. Bronwyn Simpson pointed out that Catherine is wearing the dress Ruth wore in the oval photograph. 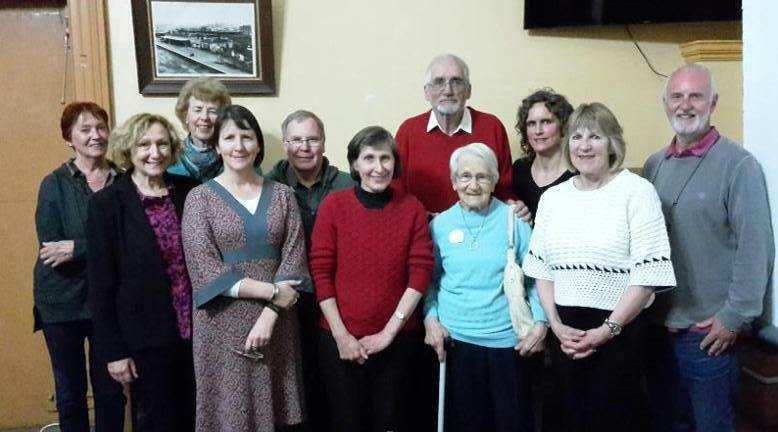 Family members present numbered 11 - from left Alex Bury (married to Lousada 4th cousin of Julian Land ie John Bury on right), Bronwyn Simpson (Lousada 2nd cousin), Diana Mayne (married to Hall 2nd cousin once removed David Mayne not present), Kathy Olden (Lousada 2nd cousin), David Wilson (Lousada 3rd cousin), Lynne Bickers (Hall 3rd cousin), Julian Land, Audrey Dowel nee Lousada (aunt), Clare Land (daughter), Dawn Bone (Lousada 1st cousin) and John Bury (Lousada 4th cousin). The presentation and this photograph took place in the 1st floor meeting room of the Old Shire Hall.